we’re always on the lookout for fun materials we can use in our diy projects. this time we found it right under our noses (actually it was right under our cats’ noses). after giving them a special treat of wet food the other day, we decided to repurpose the empty can into a handy little pincushion. all it took was some poly-fil, a strip of decorative paper, and some leftover linen from our appliqué pillow project. super simple, super cheap, and our cats are already begging us to make another one. click here for the full instructions or just click “read more” below. 1. carefully remove label from outside of can. 2. trace label onto your piece of decorative paper, adding 1/2″ to the length for overlap. 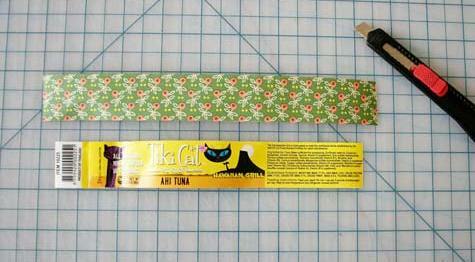 3. attach to can with one small strip of double-stick tape, and overlap ends with a second piece of tape. 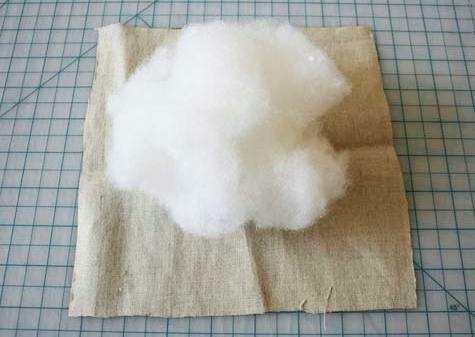 4. place a handful of poly-fil in the center of your fabric square, gathering the ends to create a loose ball shape. 5. line the inside rim of the can with hot glue and insert the fabric/poly-fil ball, with raw edges going into the bottom of the can. 6. tuck in fabric until it is taut. insert pins. What a flashback! I remember making these in the 70s with a spray paint can lid! My mom had quite a few lovely pincushions covered in calico. Yours are a little more groovy than mine were! I made of those for mothers day in the first grade. Wendren: Ive been looking for a new pincushion….this is just the thing for me. Thanks. Aren’t most pin cushions filled with sawdust? I find that makes them firmer, and thought it was better for the pins. enough of the DIY! it’s getting boring. We all do these kind of things. Move on. I’m not a DIY kind of gal but its such a lovely photograph! Yeah, it’s a shame there’s no other content to read on the site. I’ve been needing a pincushion, so I’ll certainly be making on of these! i love all the diy! keep them coming. and i thought most pincushions were filled with some sort of emery sand. to sharpen you pins. but i don’t think that would work for this. it’s just cute. besides, how many time do you need to sharpen your pins? Awesome… I am in desperate need of a pin cushion and I think I have everything mentioned here to make one! my cat loves tikicat brand tuna! what a great idea –will have to save a couple now. 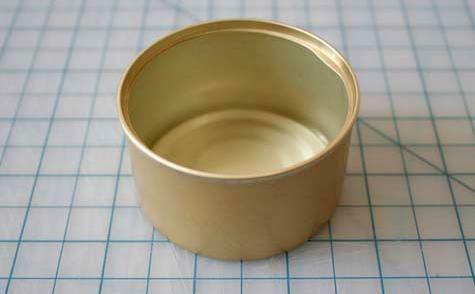 I used to make tons of these with my mum for gifts when I was in grade school – the only difference was that we didn’t open the can all the way around so we could pry it open and turn the lid into a chair back with the stuffed tin being the seat. Lots of our rellies still have them! I also love the DIY stuff. Keep it up! 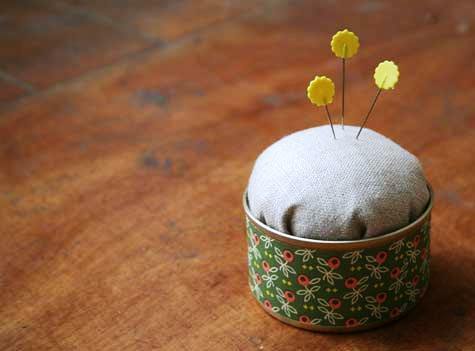 You can use old tea cups to make cute pincushions too! i am making this today. so cute…. and don’t stop the diy! i love all of the diy inspiration. I love the DIY section. I think this a great project and am going to go ahead and make myself one of these! Very sweet. I look forward to DIY every week. I’m one of those people who always wants to do this stuff, but doesn’t have enough confidence to get started. I always come here for inspiration – and that’s what I get, especially with simple projects like this. It opens the doors of my imagination for other ideas to come in! Thank you so much! Love the decorative paper used! Can we get a source please? The decorative paper is a leftover scrap from a sheet of gift wrap we purchased at Paper Source (http://www.paper-source.com/cgi-bin/paper/giftwrap/sheet_wrap.html), though I don’t see it on their website. They’ve got lots of other great patterns though!! Wallpaper scraps are very good. Some have texture &/or great protective coating on the surface. P.S. I love the DIY section and I love the idea of using stuff we already have around the house or what was headed to a landfill. Thank you very much Lauren. Very kind of you. Hey, I think that is a cute idea and it’s nice to share, not EVERYONE has made these. If you can get some wool roving to stuff your pincushions, your needles and pins will not rust. The natural oil in the wool keeps them in good condition. You may be able to find this at shops that specialize in kitting, spinning and felting supplies. I love this. I love to glue a magnet on the bottom of these pincushions to I can either attach the pincushion to the metal table or machine…or use the magnet as a little vacuum for any stray pins that might have not made it to the cushion. THANKS for a fun idea. I look forward to the DIY every week! That’s a CUTE idea! Thank you! I hadn’t seen it before. My son made me one of these pincushions in cub scouts nearly 40 years ago and it’s been my “main” pincushion ever since! It’s very cute! I will be making lots of these! Thank you for the cute idea! very fine steel wool will also sharpen needles and pins, I put small rocks in the bottom to weight it down some, filled in the remainder of the bottom with polyfiberfill and then 0000 steel wool in the top. Mom is a quilter and this is a gift for her. My DH loves those little tins of fruit. They should work too. I made one of these in 8th grade sewing class but we filled ours with dried coffee grounds. Very cute idea! I was looking for various ways to repurpose tin cans and found this. The reason the small strawberry pincushions have emery is to sharpen your pins and needles, but you can’t leave your needles in those cushions or they will rust. The filling used here is just fine for it’s use, and it’s an old-school diy project, nothing wrong with that, I love redoing things I did with my mom and grandmother. Everything old is new again. This is so cute! Definitely a contender in my new pincushion-to-make search. I’ll be linking this tomorrow. Thanks! What a great upcycling idea for cans.! I’m using a DIY pincushion shaped like a little pillow that I stitched from leftover sweater scraps from the pogos that I make. I kept losing it, so I added a patch of rubbery rug padding to the bottom. Now it stays put and I no longer find it on the floor. Our qlting group made pincushions for our show last year. We used crushed walnut shells for filling. I also collect different hand made p.c. and love them. BooHoo to the person that said DIY was boring. Already made one but wanted an idea of how to make the cushion smoother around the gathered edge. very cute. i save tins all the time…and we use that exact kind of cat food:) apparently your cats have expensive tastes, too! Really! For all the NAY sayers out there, you dont have to click on any of the links you know. I for one am happy of the DIY ideas, One can never learn to much…and to reuse something that is going to be trashed..all the better. I have never made on of these and I am 34, off to make one now! Keep up the DIY!!! I made one like this, but I used an old expresso cup and embroidered felt. You can use pellets and/or kitty litter to stuff the pin cushion. How do you print the instructions? I want to make one but cant find how to just print instructions. there isn’t a print button for these. you can print the full post or you can just cut and paste the steps into a text doc. I made one of these in grade school some 30+ years ago and never forgot about it. I’ve been looking for the basic steps on how to do it and here it was. Thanks so much!!! If you fill with sand rather than poly-fil it will sharpen your pins each time you stick them back in. You could use old tights (pantyhose) cut into bits for the filling. Great idea! Regarding the filling – I wash old polyester bed pillows in the machine and dry them carefully. One pillow makes TONS of stuffing! Another idea- make your circle and pull it tight and tie closed. Next cut a piece of cardboard in a 3-4″ circle. Cover one side with co-ordinating fabric. Use pre gathered lace and place in circle about where the ball would fit. Center the ball open ends down on the cardboard. Glue in places on top of the gathering. voila a ladie’s hat. You can also glue a dowel or long stick to the center of the hat on the back side and use it as a handle.